Interactive features like these are really stepping up kids' toys, helping to keep their attention, engage their imaginations, and even help teach kids about programming and technology. Unicorns, robots, and dinosaurs--oh my! This fall, kids are sure to have some crazy new friends ready for playtime. Best of all? You never even have to schedule a playdate. Technology has made its way into the playroom for years -- but scratchy sounding voice boxes and mechanics that spark noisy, grinding movements are simply not enough anymore. "Watch me" toys, which essentially just perform for kids with the push of a button, like 1996's Tickle Me Elmo, are no longer impressive to kids or their parents. But what if your toy actually understood you? What if it had more than 150 unique sounds, phrases, responses and movements? What if it had its own unique personality? Sounds more like a friend, than a toy, doesn't it? Interactive toys are very much a reality this year, with toy companies big and small introducing products that physically and verbally respond as kids play along with them in a seamless, realistic way we've never seen before. From trainable pets, to dolls and plush that answer kids' questions, toys are more engaging and lifelike than ever before, giving kids a permanent, round-the-clock playmate. Best of all, the integration of interactive technology brings some fantastic creatures to life right before kids' eyes. 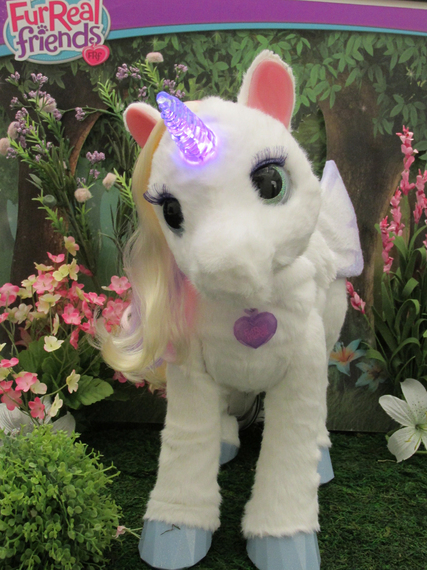 This year, Hasbro's Furreal Friends line will expand to include StarLily, My Magical Unicorn. Designed for kids ages 4 and up, StarLily features more than 100 sound and motion combinations. She responds differently as kids play with her, such as nuzzling her head against a child's hand when he or she touches her. StarLily's sparkly eyes open and close realistically, showing off her beautiful glittery lashes, and her wings flutter at different intervals. Her front hoof moves up and down, interacting with kids as they play with her, and her horn changes colors depending on her mood. Kids can also feed StarLily, groom her, and further the interactive fun with a corresponding app. Her movements are so realistic and make her so adorably endearing, kids will have non-stop fun with their new unicorn friend. Part of the Meccano line, Spin Master's new Meccanoid G15 KS is a customizable, buildable robot friend that uses voice recognition to say thousands of phrases, tell jokes, offer fun facts, play games, and initiate conversations. It can even retain information, like remembering kids' birthdays. The Meccanoid g15 KS also features Learned Intelligent Movement (LIM), meaning kids can move and record the robot's movement and speech, and watch as it plays it back. Kids can rebuild the Meccanoid into other things, too, like a dinosaur or a recycling contraption. The bot also connects to smart devices via Bluetooth, offering even more ways for kids to program, play, and engage. A truly impressive toy, the Meccanoid stands about 3 feet tall--further enhancing its interaction with kids. A dinosaur may seem an unlikely pet, given that it's 2015; but thanks to WowWee, now kids can have their very own dino at home that they can train, play with, and even program. The MiPosaur, designed for kids ages 8 and up, is a robotic friend with evolving intelligence and a unique personality. Featuring GestureSense technology, the MiPosaur can interact with kids and its surrounding environment. Kids can control it with a swipe of the hand and make it turn side to side, do a 360-degree spin, sit, or lean forward. The included interactive TrackBall is equipped with BeaconSense technology, and kids can use it with the MiPosaur to play games, guard the ball, learn tricks, or alter its mood. Not always a happy little dinosaur, the MiPosaur gets irritated when kids pull on his tail, and it will even roar. 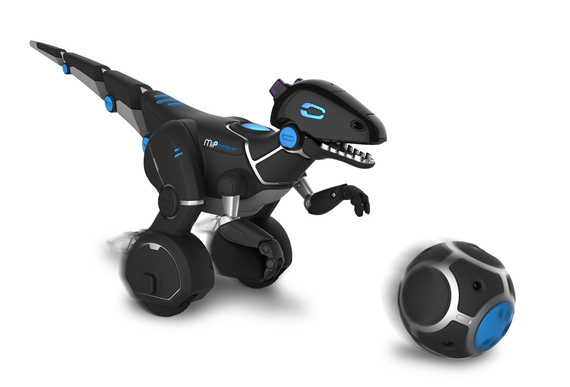 The adorable dino is also fully interactive with WowWee's MiP robot, which released last year. Plus, there's a Bluetooth-enabled app featuring fun games and more programming options.